A "funeral" for pop star Michael Jackson has been taking place in the village of Krindjabo, where he was crowned a prince of the Agni people on a visit to the country in 1992. The village has been in mourning since his death on 25 June. The villagers appealed without success to have the body returned, but since his official funeral in Los Angeles they have decided he also needs to be properly buried according to the customs in the Sanwi kingdom. The village football pitch here has been transformed into a green square surrounded on all sides by tents full of what I guess is around 1,000 people from the village and - like us - from Abidjan to formally say goodbye to one of the biggest pop music stars of the last 50 years. You may know him as Michael Jackson, but here he is Prince Michael Amalaman Anoh. 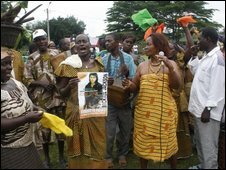 One of the organisers of the event, Emmanuel Kassy Kofi, said they had appealed through the international media and the US embassy in Abidjan for Michael Jackson's body to be returned. Michael Jackson was enthroned as a "king-in-waiting"
Michael Jackson was enthroned as a king-in-waiting and should normally be buried in a river. "If for example the Americans or his family permitted for us to bring the body here we'd do what needs to be done," Mr Kofi said. "We asked for the body - it's for us. 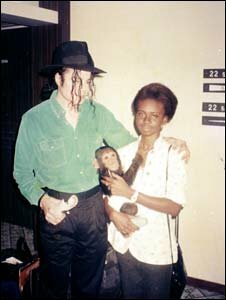 It was Michael Jackson himself who tested his DNA and said it'd be good to find his family. "'The King also recognised certain signs that he was part of the dynasty. And the royal seat that the king's sitting on - Michael Jackson sat on it too." The organisers say his spirit is already here and will be put to rest. The whole village is in mourning here until Sunday when the successor to Prince Michael Jackson Amalaman Anoh will be announced. Until then, the party and memorials will continue well into the night. Does Jackson's concert film capture a star at his peak?